With apologies to People Magazine, I thought it would be fun to figure out the “Top 25 Most Intriguing People” of the 2007 American League playoffs. Why wasn’t the National League included as well? Until last week, I didn’t watch a single inning of an NL game — you know, the whole Quadruple-A thing — and felt vindicated by the decision when Red Sox castoffs Joel Piniero, J.C. Romero and Wily Mo Pena played prominent roles in last week’s pennant race. Look, I don’t have anything against the National League. As it proved last October, it’s perfectly capable of giving us a World Series champion. It’s just that there’s only so much time in the day. I watch every Red Sox game and spend the rest of my baseball TV time rooting against the Yankees, following the guys on my AL-only keeper team (I watched more of Andrew Miller’s starts than Miller’s family did) and getting angry about stuff like one of the “Baseball Tonight” guys deciding in mid-August that the Mariners had a better chance of getting the wild-card than the Yankees. Somewhere along the line, I became a one-league guy and jettisoned the NL from my life. I didn’t even know how to spell Troy Tulowitkowski’s name correctly until Monday night. Er, Troy Tulowitzki. Is this acceptable? Of course not. I should be following both leagues just as diligently. Starting next season, I’m joining a second keeper league (NL-only) to further that purpose, even if it’s a decision that will inevitably lead to my first divorce. (Note: I said “first” because I’m good for at least three before everything’s said and done.) But that’s a year away. For now, I can only offer you thoughts about the American League playoffs. And I have many. Put it this way: When the good news is that one of your key second-half guys is “fine running on a straight line,” and it’s early August, it’s probably time to give up on your fantasy baseball team. Rivera finally returned in September and didn’t look terrible, even playing the outfield in a few games (although he didn’t look that sharp). At the very least, he’s a legitimate X factor (only a year removed from a .310/23/85 season) and a much-needed righty bat, assuming he’s healthy enough to play outfield all month. On a personal note, he scares the hell out of me when he’s up, … which gives him something in common with no other Angels hitter except Vlad. Fortunately for Sox fans, it looks like the Angels will sit Rivera and play Chone Figgins out of position in right field, at least for the first two games. You need three competent relievers to win in October, preferably four. Boston has Jonathan Papelbon. There’s one. 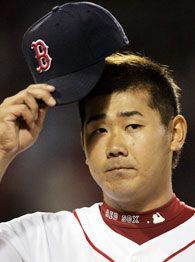 Hideki Okajima is the second one, assuming the whole “tired arm” thing is behind him. Eric Gagne is definitely NOT the third one. (I knew that one was doomed right after the trade, when my buddy JackO started making “Congratulations on picking up Penn from Penn & Teller” jokes.) Timlin was approaching Stage 5 of the Generic Reliever Career Arc (look washed-up in the AL, get waived, then sign with an NL team and immediately look lights-out again) before bouncing back with an underrated last three months (29.2 innings, 27 baserunners, 20 K’s, 2.73 ERA). Delcarmen looks like a bullpen sleeper on paper (44 innings, 45 baserunners, 41 K’s, 2.05 ERA), only the Sox were extremely careful about putting him in big spots. We’re not sure what we have with him; Timlin seems like a safer bet to become competent reliever No. 3 because of his playoff experience. It would be one thing if Hafner turned 40 this year, … but he turned 30. Bizarre. He did show some life in September (98 ABs, 5 HRs, 23 RBI, .414 OBP, .551 SLG), but looking at those ’07 numbers, it’s hard to take the Indians too seriously when their best slugger’s OPS was nearly 200 points short of Micah Owings. This could be the year when he drags out “God Bless America” for 20 solid minutes to ice an opposing reliever. The Yankees need all the help they can get. He’s on the list for all the casual fans getting ready to experience their one and only, “Wait, Reggie Willits is white?? ?” moment in the playoffs. That reminds me, I wanted to name Kid No. 2 “Nate” so I could create my own Reggie Cleveland All-Star from scratch. Nate Simmons. Is that glorious or what? He sounds like a receiver/kick returner on the Cardinals or something. Of course, my wife shot this idea down. Briskly. This 2007 Yankees team is right in his wheelhouse — no loose cannons, no head cases and, most importantly, no black people. (Just kidding, I made that joke for Gary Sheffield.) Even if they get swept by the Tribe, nobody will be pointing fingers at Torre; they’ll be too busy blaming A-Rod and/or Brian Cashman’s game plan of building his starting rotation around Chien Ming-Wang and three guys who are a combined 125 years old. But Torre fascinates me this month for one reason — for the first time since Rivera was his set-up guy in ’96, Joba Chamberlain gives him a seventh/eighth-inning workhorse, someone who could do a reasonable imitation of K-Rod in 2002. Even better, he’s had Joba for only a couple of months and hasn’t had a chance to blow out his arm yet. (If Joba had started the season with the Yanks, he’d be wincing his way through a handshake with Dr. James Andrews right now.) 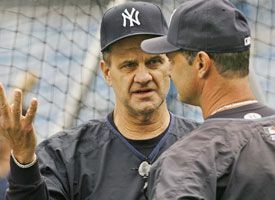 Which brings me back to my original point: This 2007 Yankees team is right in Joe Torre’s wheelhouse. This will be written within the first two paragraphs of Joe Borowski’s obituary: “In 2007, Borowski was so erratic that Indians manager Eric Wedge broke the major league record for ‘Most facial twitches by a major league manager in a single season. '” I’m excited to see him twitch in HD. Which reminds me — kudos to TBS for banging out its new HD channel just in time for the playoffs. This briefly renewed my faith that TV networks actually care about their customers. Then I remembered how Fox blacked out Red Sox and Yankees games on the West Coast every Saturday for six straight months, refused to go to a split-screen for Phils-Nats and Pads-Brewers on Saturday, and didn’t even send a sideline reporter to the Pads-Brewers game, leading to a terrifying ninth inning in which Eric Karros (breaking out the full-fledged monotone) called the start of Milwaukee’s comeback by himself because Matt Vasgersian was headed down to the clubhouse to interview the victorious Padres. Seriously, Fox, you couldn’t have pulled a cute girl out of the stands, handed her a microphone and told her to ask everyone, “How does it feel?” Would that have made too much sense? His best managing quality doubles as an occasional Achilles’ heel: During the regular season, he’s staunchly loyal and gives his players every possible chance to succeed — even if they’re failing miserably — which works great in some cases (like Dustin Pedroia) and disastrously in others (like Gagne). You can’t do this in the playoffs. We’ll see how he handles Gagne, J.D. Drew and even Dice-K over these next four weeks. Let’s hope the phrase “kid gloves” isn’t involved. Other than the Mets’ collapse, a 46-homer season from Carlos Pena and Toronto’s getting 357 ABs and a .917 OPS from Matt Stairs, the most shocking revelation of the season was Ripken’s yeoman’s work as TBS’s studio guy during Monday night’s Rockies-Padres game. This can’t be emphasized strongly enough: He was GREAT. I actually learned stuff from him. (I know, I know, a novel concept.) Now, there’s a chance you could stick a corpse with Ernie Johnson and the corpse would turn into a B-plus analyst. But did you ever think Ripken would be a good TV guy? I’m still shocked. Maybe it was all those years serving as the bodyguard on “The Jerry Springer Show.” Anyway, I’m excited for the first round on TBS now … although I maintain that Barkley should have been involved. My Yankee friends (sadly, I have a few of them) seem unconcerned about the Sabathia/Carmona combo, even though it’s the best 1-2 punch in the league, even though Fausto had a monster second half, and even though Sabathia might be the best big-game pitcher of the four A.L. playoff teams. I don’t quite get it. And while we’re here, how could anyone pick Josh Beckett for the the Cy Young Award over Sabathia when Sabathia threw 41 more innings and had similar stats? What am I missing? I mean, I’m the biggest homer on the planet and even I don’t think Beckett deserves it over Sabathia. Why is this even a debate? So wait, if your setup guy pitches 283 games and 361 innings in a four-year span, that’s a bad thing? Poor Shields finally fell apart after the All-Star break (29.1 innings, 53 baserunners, 7.36 ERA), potentially robbing the Angels of one of their greatest postseason weapons and insuring that he’ll be a Met within the next 10-18 months. My dad is convinced that Scott Boras pulled a double-whammy on the Red Sox by rigging the Dice bidding in their favor, then demanding that they overpay J.D. Drew with a lavish long-term deal as a return for that favor. He’s been begging me to put this in a column since June. I didn’t do it because I didn’t want you to think that he was a lunatic. Here’s what we weren’t counting on: Heading into the 2007 playoffs and having more faith in Drew than Dice — I mean, at least Drew has been hitting lately. Regardless, all bets are off with Dice in the playoffs. He could go 4-0 with a 2.22 ERA and I wouldn’t be shocked. He could go 0-3 and get left off the World Series roster and I wouldn’t be shocked. The ceiling and the basement have both been removed. Two ballyhooed young guys who could become household names this month. Or, they could be going home in four days. By the way, watch the reactions to Sizemore from the TV guys — for some reason, he turns them into jelly. They love him. It’s like listening to Chris Berman narrate Brett Favre highlights. Could this be our last brush with the “Texas Con Man”? Let’s hope it ends the way it always should have ended — with the Rocket waddling off the field and tipping his cap, with the Fenway fans cheering and applauding a great career, and with the Red Sox leading the Yankees by seven runs. The X Factor. And since there’s nothing left to be said, here’s a question for you: For a team that dominated for years partly because of a dominant closer, why wouldn’t they groom Joba for the Mariano role? He has the catchy name, the demeanor, the unhittableness (I just made up that word), the spiritual connection with Yankees fans, the rare ability to go to another level when the crowd’s behind him. … Seriously, what’s left? When the Red Sox were debating Papelbon’s future last summer, I wrote about the closer/starter conundrum and came to the conclusion that Rivera’s worth couldn’t be quantified compared to the average closer and that “with the way October baseball works in the 21st century — three rounds and 19 possible games over four weeks — an extraordinary reliever might be the single greatest asset for any team.” Now that he’s nearing the end, you’d think Joba would take his place. It’s the logical move. The Red Sox have owned Lackey over the past four years: 37 innings, 30 runs, 74 baserunners, four losses. If that doesn’t change over the next week, so long, Los Angeles Angels of Anaheim, Calif. If Lackey doesn’t do them in, Vlad’s gimpy knees will probably do the trick. But you know what really hurts? Seeing Vlad as a DH and not getting to see him unleash that cannon in right field. During a Sox-Angels game two months ago, after somebody flied out on the Red Sox, the Boston runner on third did the stutter-step thing to draw a throw from Vlad. Now, we all knew the runner wasn’t going. You don’t run on Vlad. But Vlad jumped at the chance to uncork a 275-foot frozen rope as everyone ooohed and ahhhhhed, almost like he wanted to remind everyone that he still had a cannon arm. It was like seeing someone with 36D’s jump at the chance to put on a T-shirt that was two sizes too small. Heeeeeeey, look at these! If Vlad is headed for DH City, it’s too bad he can’t sign over his cannon arm to Reggie Willits or something. I’m gonna miss it. We knew about the “no emotion” thing, as well as the “penchant for taking called third strikes to kill late-inning rallies” thing and the “he may not have any actual blood in his body” thing, but everyone’s main concern about Drew was that he couldn’t stay on the field. Well, he stayed on the field. In fact, most of us wanted him off the field so Jacoby Ellsbury could play. We couldn’t get this guy off the field. Then he started hitting in September (.342 BA, 1.072 OPS, 4 HRs, 18 RBIs) and you could totally see how these scouts and GMs get sucked in by the J.D. Drew Experience — he has five tools, he uses them all, and he has the world’s most perfect swing. Now I don’t know what to think. Is he getting hot at the right time? Is he suckering us in for the ultimate screw job? Am I going to be peeing blood in two weeks because of him? There’s no way to know. I hate this. I hate not knowing. So here’s a Red Sox stat to cheer you up (if you’re a Sox fan), as well as a stat that partially explains why they overpaid for Lugo and Drew: The Red Sox finished with nine of the top-42 AL batters in pitches-per-at-bat. Together, Youkilis (6), Varitek (13), Ortiz (15), Drew (29), Crisp (33), Lugo (35), Ramirez (37), Pedroia (41) and Lowell (42) averaged a shade under four pitches per at-bat, which means that starters were going through Boston’s lineup three times and that’s it. Plate patience is one of those things that only works if everyone is doing it — in a playoff series, it’s the easiest and best way to wear out an opposing bullpen. Which is why the Boston offense will be tougher in October than people realize, whether Drew and Lugo are hitting or not. Funny how roles can reverse: Back in ’96, Rivera was the unhittable set-up guy and John Wetteland was the veteran closer who always made it interesting. Now, we have Joba as the unhittable set-up guy and 37-year-old Rivera as the veteran closer who’s been making it interesting lately (and by lately, I mean, “the last week”). 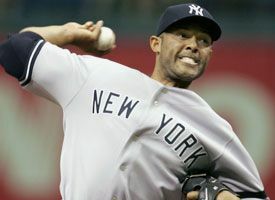 But when you study the 37-year-old Rivera’s career stats, four things stand out about the 37-year-old Rivera. First, his statistical consistency from 1996 through 2007 is absolutely incredible. You can’t even tell the seasons apart. It’s creepy. Second, his postseason pitching resume is even more incredible — in 73 postseason games, the 37-year-old Rivera is 8-1 with 34 saves and a 0.80 ERA in 112.2 innings. Third, he’s carrying all that postseason mileage on a 37-year-old body and we haven’t seen any real effects yet. And fourth, he turns 38 in November. Here’s one thing we haven’t seen during the 37-year-old Rivera’s career: A Yankee reliever who was clearly more effective than him. In 19 games and 24 innings, Chamberlain has allowed 18 baserunners and one earned run and struck out 34 guys. He isn’t just the best reliever on the team, he’s the best pitcher on the team. How will this affect the psyche of the 37-year old Rivera? We don’t know. But I hope and pray it ends poorly. Until September, I was steadfastly convinced that the 2007 Red Sox didn’t have a chance for one reason: Big Papi wasn’t Big Papi. From ’04 to ’06, when Ortiz was working his magic in the late innings, you could see him transform into someone else at the plate, almost like Ali Larter morphing from nice Niki to evil Jessica in “Heroes.” I always described it this way: Uh-oh, he’s locked in! He’d twirl his bat a little more slowly. The crouch would become more pronounced. His eyes would lock onto the pitcher the same way a liquor store owner stares down a suspicious character who walks into his store. He looked like a cobra ready to pounce. It was like watching someone adopt a game face, then apply it to his entire body. When Ortiz got locked in, you knew something good was going to happen. In 2007, he stopped locking in. He looked tired. It looked like his knees were bothering him. Something wasn’t right. Statistically, there wasn’t a significant difference from 2004-06 except for the home run drop … but something wasn’t right. You could see it. Then he caught fire in mid-August, kept it going into September and morphed into the old Big Papi again. In the process, the Red Sox stopped resembling the team that broke out to a 36-16 start thanks to starting pitching, two great relievers and a solid offense; now they have decent starting pitching, one great reliever, three decent relievers and a much more dangerous offense. In other words, they look like the 2004 team, mostly because David Ortiz looks like the 2004 David Ortiz again. For the other seven playoff teams, this is a bad thing. Some key stats to consider: 65.2 innings, 94 baserunners, 8 blown saves and a 5.07 ERA. Yikes. This is going to end badly. Can’t you see Borowski slumping toward the Indians’ dugout as one of the Yankees is rounding the bases with his right arm raised up, the Yankees are charging out of the dugout and all the Yankee fans are going bonkers? We’re headed for a Red Sox-Yankees Armageddon in 10 days. It’s going to happen. Start stockpiling canned goods and beef jerky now. Give the man credit: That was one of the most decisive MVP seasons in recent memory. The guy did everything — he even kept the tabloids busy and ticked off other teams — and within five months, Yankee fans went from “Screw that guy, let him leave” to “We gotta sign this guy, give him a contract and tell him to fill it in himself!” Of course, if he stinks this month and the Yankees fall short, everyone in New York will pack his bags and encourage him to play in Colorado or Anaheim. That’s the nature of the beast. However it turns out, there isn’t a more intriguing American Leaguer in the 2007 playoffs than Alex Rodriguez.